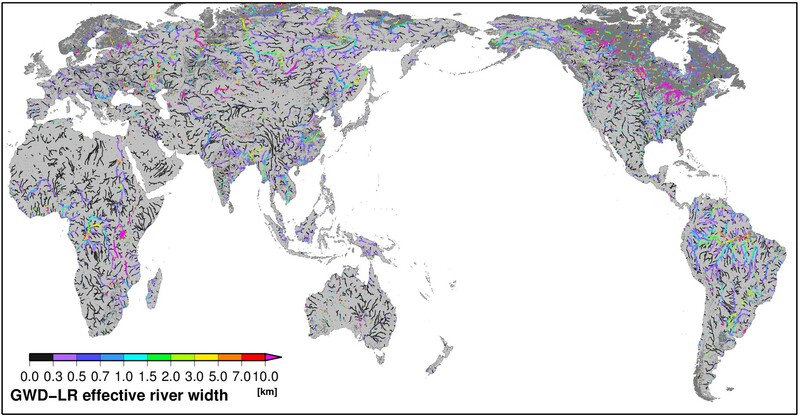 River width is a fundamental parameter of river hydrodynamic simulations, but to date no global-scale river width database based on observed water bodies has been available. Here we present a new algorithm that automatically calculates river width from satellite-based water masks and flow direction maps. The Global Width Database for Large Rivers (GWD-LR) is developed by applying the algorithm to the SRTM Water Body Database and the HydroSHEDS flow direction map. Both bank-to-bank river width and effective river width excluding islands are calculated for river channels between 60S and 60N. The effective river width of GWD-LR is compared with existing river width databases for the Congo and Mississippi Rivers. The effective river width of the GWD-LR is slightly narrower compared to the existing databases, but the relative difference is within ? }20% for most river channels. As the river width of the GWD-LR is calculated along the river channels of the HydroSHEDS flow direction map, it is relatively straightforward to apply the GWD-LR to global- and continental-scale river modeling. The GWD-LR represents effective river width (excluding islands). The original resolution of GWD-LR is 3 arc-sec (~90m), but the version in this website is upscaled to 1/200, 1/40, 1/10, 1/4, 1/2. The coverage of the GWD-LR is between 80N and 60S. The data format is 'Fortran Direct Access Format' (i.e. ESRI 'BIL/BSQ/FLT' raster format with the HDR file, GrADS binary with CTL file). Detailed description of the data format is available in the description document. The GWD-LR is licensed under a Creative Commons Attribution 4.0 International License (CC-BY 4.0). To view a copy of this license, please visit http://creativecommons.org/licenses/by/4.0/. By downloading and using the data the user agrees to the terms and conditions of this license. Notwithstanding this free license, we ask users to refrain from redistributing the data in whole in its original format on other websites without the explicit written permission from the authors. GWD-LR is available for download at http://hydro.iis.u-tokyo.ac.jp/~yamadai/GWD-LR/. The copyright of GWD-LR is held by the developers, 2018, all rights reserved. Citation to the paper is adequate if you simply use the G3WBM/G1WBM. If you asked help for additional handling/editing of the dataset, or your research outcome highly depends on the product, the developer would request co-authorship. or please contact to the developer (yamadai [at] iis.u-tokyo.ac.jp) to get an access. Global coverage data is available at three different resolutions. 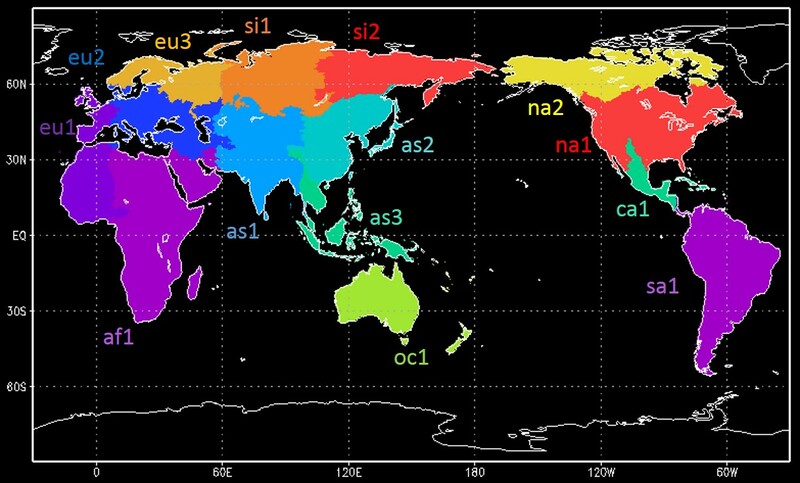 The 0.005 degree data is divided into 14 regions. Please see the description document for detail. Please contact to the developer (Dai Yamazaki) if you are interested in the original 3sec (90m) data. GWD-LR is generated by applying the Global River Width Algorithm (GRW Algorithm) to SWBD and HydroSHEDS. The detailed explanation on the GWD Algorithm is summarized in the document. download the GRW Algorithm document. The Fortran90 code with sample datasets can be downloaded. Download the code [[password required]].